We have created a new section for mugs with the addition of the new travel mugs. "Work for Peace and Justice" text on one side, peace dove with olive branch graphic on the other side. Made of heavy duty plastic, 15 oz capacity, insulated, keeps beverage hot or cold, dishwasher safe. Union made in the U.S.A. Available ONLY in the Smoke Grey color. Cobalt Blue is discontinued. Our U.S.-made 13 oz. 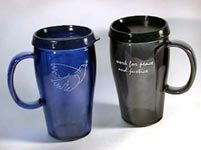 Cobalt Blue Glass Mug with the Margaret Mead quote on one side, and the words "Peace & Justice" on the other side. YOU choose any 12 buttons and and/or bumperstickers: Write the product codes or names of each item in the "Ordering Instructions" or the "Customer Comments" field. We will price the buttons you select at $1 each – HALF the regular $2 price. You save $12. Your buttons will be packed in the mug, and the mug will be put in a corrugated cardboard box. To ensure against breakage, we double-pack the boxed mug in a box with recycled paper, foam "peanuts" or air pillows, all re-used from packing in cartons sent to us from other suppliers. The mug and buttons are all made in the U.S.